The Avolites Group took to the road for 2012’s first international trade fair for the events technology sector covering a broad spectrum of products and services with their German partner Trendco. Avolites Media Ltd. exhibited its new Ai Media Server in tandem with Avolites Ltd’s Sapphire Touch and Titan Mobile lighting control consoles. Recently, Avolites Media Ltd bought the intellectual property rights to manufacture and distribute the Ai Media Server worldwide. Prolight+Sound offered visitors the chance to view the future of this advanced and fast developing system. As well as demonstrating the currently available, industry leading Ai Media Server, visitors were granted the first preview of ‘Sapphire Media’. 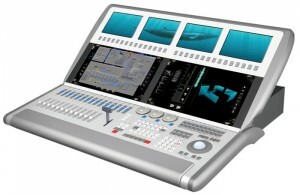 The Sapphire Media Live Video Controller creates a new class of show media controllers unlike anything seen before, integrating the accuracy of multi-timeline control and flexibility that Avolites is well known for. At Prolight + Sound, Avolites Media Ltd also introduced Dave Green and Selvin Cooper as the latest recruits of the technical support team. Dave Green is the creator and Lead Developer of the Ai system and was on hand to demonstrate as well as receive direct end-user feedback. Selvin Cooper joins Avolites Media as the service and support engineer and brings with him a wealth of experience within the digital media industry. Selvin’s presence at the show underlines Avolites Media’s intentions of an ongoing commitment to effectively train and support this global industry. "It’s all moving forward very fast," states Steve Warren, managing director of Avolites Media Ltd. "We have been awarded a number of major projects already and many designers and major video rental clients say it surpasses everything on the market. Currently we are shipping the full hardware server, featuring four HD outputs as well as a range of software only, dongle locked solutions to fit any budget." Training courses are also available at Avolites Media Head Quarters in London. With bookings filling up fast, the two-day course is invaluable to all purchasers and users of the Media Server.